Adam Reilly interviewed Falmouth residents Sue Hobart and Neil Andersen, and chair of the town’s energy committee Megan Amsler, for the set-up piece airing on WGBH-2 television’s “Greater Boston” in Falmouth Wind Turbine Debate (4/8/13). Then host Emily Rooney interviewed Amsler and Eleanor Tillinghast, a tireless advocate for conservation and to site turbines where they will not impact residents or delicate ecosystems. 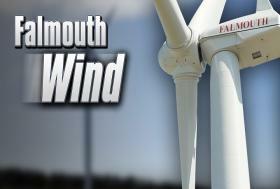 The town of Falmouth has been on the leading edge of renewable energy. It boasts three massive wind turbines – one owned by a private developer, two others by the town itself. But some neighbors say the machines make their lives miserable – and now Falmouth is on the verge of tearing them down.